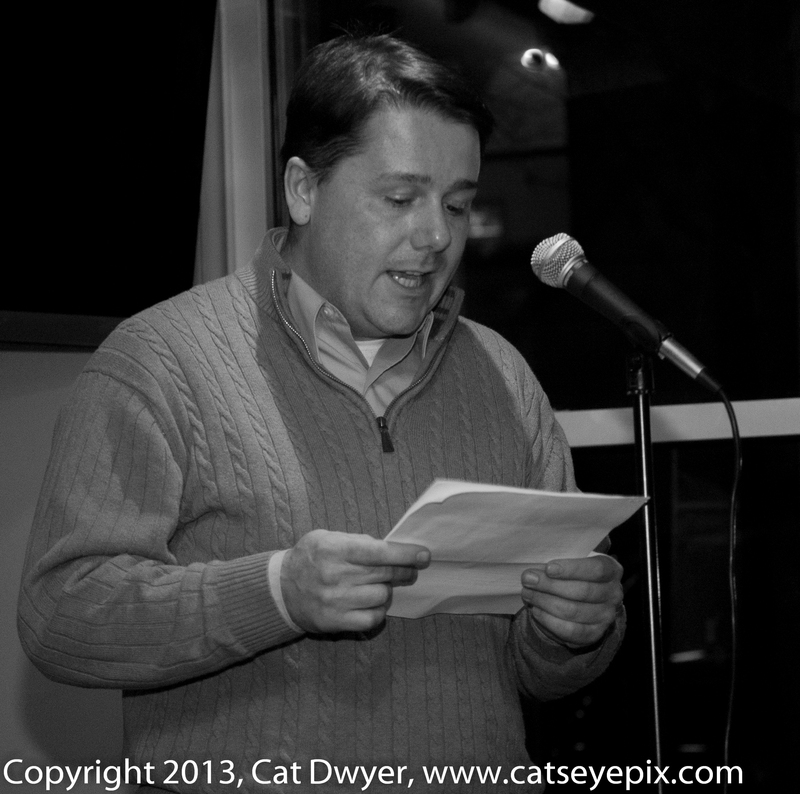 Malachy summed it up: “Another wondrous evening” at the Salon at the Bar Thalia on Tuesday, March 5, 2013. 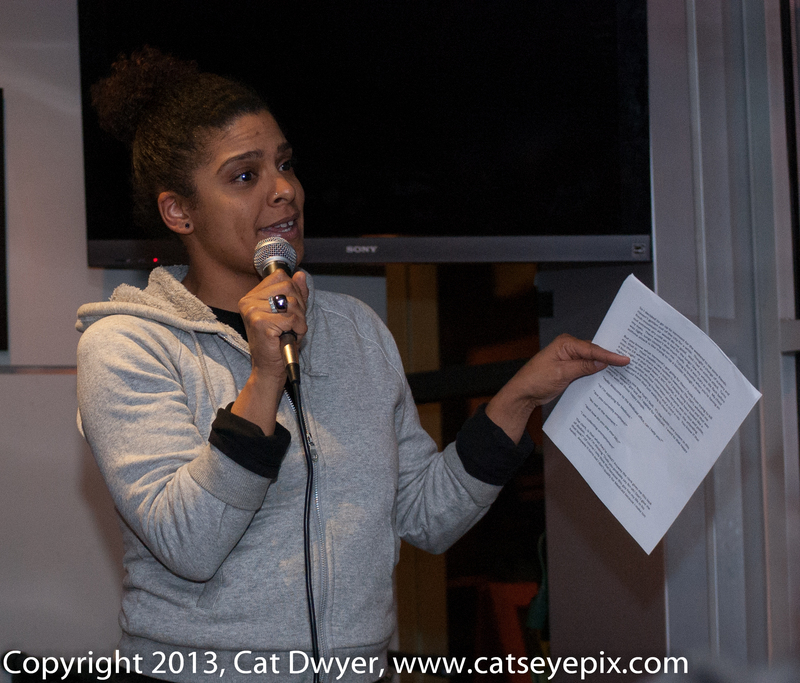 Sarah Fearon, in her first time hosting, ran the night with her trademark wit and charm. 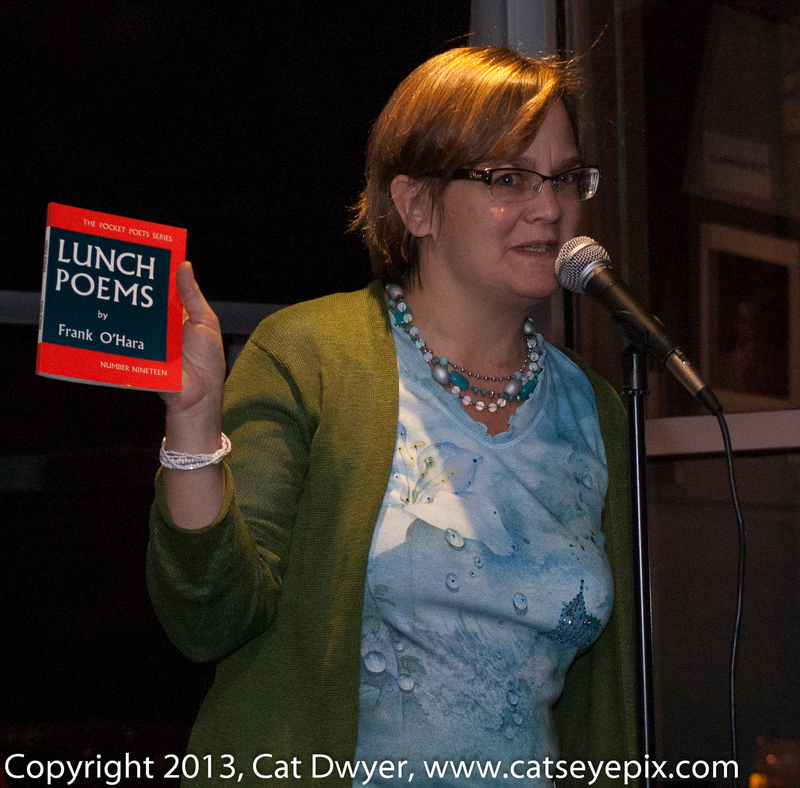 We welcomed several first-time presenters and had lots of humor on tap. At a Salon last year, Sheila Walsh read a one-act play that was so well received, she decided to turn it into a full-length play: Surrender at Watertown. 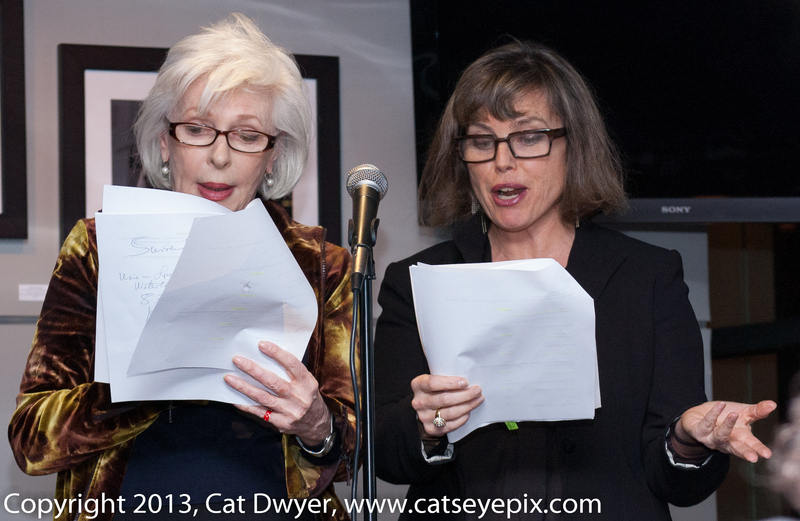 On Tuesday night Sarah Fearon and Sheila read a scene in which an adult daughter learns more than she cares to about her mother’s love life. The duo played warmly and well against each other − to lots of laughter and enthusiasm. We look forward to hearing more from this funny, touching comedy. Getting ready for St. Patrick’s Day, John Kearns read two excerpts from his short story, “Making A Visit.” Terrance, a middle aged man, kneels in a church, reflecting upon some incidents from his past, including The Second Saint Paddy’s Day Mystery: TheConsumption of the Corned Beef Sandwiches. Terrance and his mother argue about when and where to eat their corned beef sandwiches while on Fifth Avenue watching the Saint Patrick’s Day parade. Later, Terrance remembers hearing the news of his mother’s death and finding messages she never heard on her answering machine. Ray Lindie read from his story, “Monsters of the Park West.” A fatherless young boy spends Saturday at the movies in late 1940’s New York, looking for a girl he likes and threatened by a punk. A funny and poignant tale enlivened by a touch of a Scottish accent. Ray is an actor, writer and bartender. That’s was Ray’s first reading, and he plans to tell us how it ends at a future Salon. Tammi Cubilette, an actor and comedian, and another first timer at the Salon, riffed on some common complaints: healthcare, Medicaid, people who feed pigeons, and left us one piece of memorable advice: If you’re going to get sick and need hospital care, get sick in Vermont. Jack DiMonte sang “Remind Me” by Jerome Kern and Dorothy Fields. The lovely song was written for a 1940 film called One Night In The Tropics that is now notable for only one fact (other than the song): it marked the film debut of Abbott and Costello, playing minor roles and doing the first film rendition of their famous “Who’s On First” routine. Leading off the second half, Tom Mahon, versatile writer and now Salon videographer, read a powerful story called, “Dancing with Demons” about a former vet who joined the police force. An amazing cop, he nevertheless slips into carelessness and overindulgence. We find him, after the precinct Christmas party, living alone in a 5th floor walkup, estranged from his wife and kids, and his plagued by nightmares. Chris Bradley, who first read at The Cell last month to wide acclaim, shared some work inspired by his boyhood in Wayne County, Pennsylvania. In “The View from the First Branch,” nine–year-old Sean begins to see his rural world with new eyes. On his first day working as a farm hand, Sean’s boss, Art, unexpectedly stops the tractor in a hay field beside a small cemetery. Then he asked and answered his own question “How many dead people do you reckon are in that cemetery?” The right answers: “All of them.” We are glad that Chris’ voice has found him. Karen Daly read a sweet story by the Irish-born writer Maeve Brennan –“The Barrel of Rumors,” published in The New Yorker in 1954. As a young girl in 1930s Dublin, Brennan was curious about the lives of a cloistered order of nuns, the Poor Clares, to whom Brennan’s mother sent food. 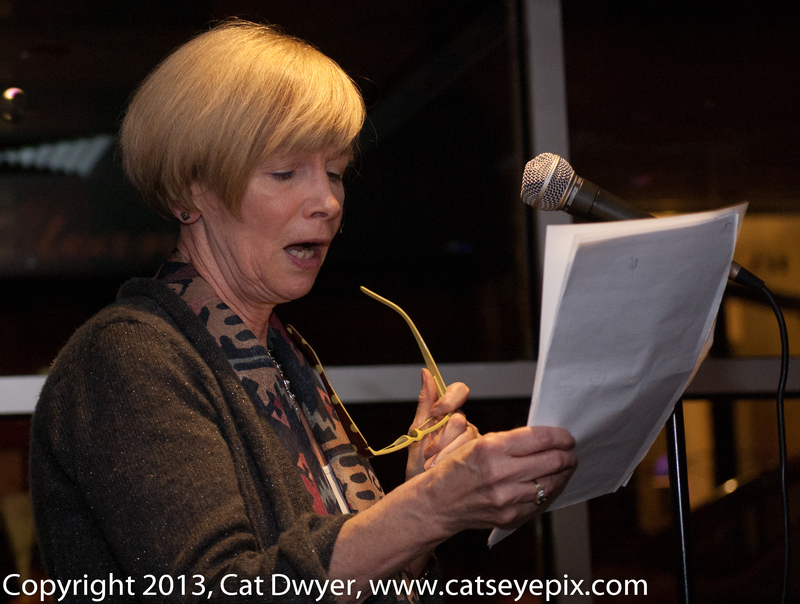 Irish language and dance teacher, Maura Mulligan read a charming story from her memoir, Call of the Lark. The tale of “The Devil in the Ballroom” was the talk of 1950s Ireland. People in rural Ireland gathered around the fire to share stories; their belief in the paranormal was not unusual. For instance, the devil himself could show up and waltz his way into St. Mary’s Hall in Tooreen. And he did. Even the press was covering his cloven hoofs. Who said dance with me Bridget, oh what the hell. She looked down and saw the cleft foot of a goat. 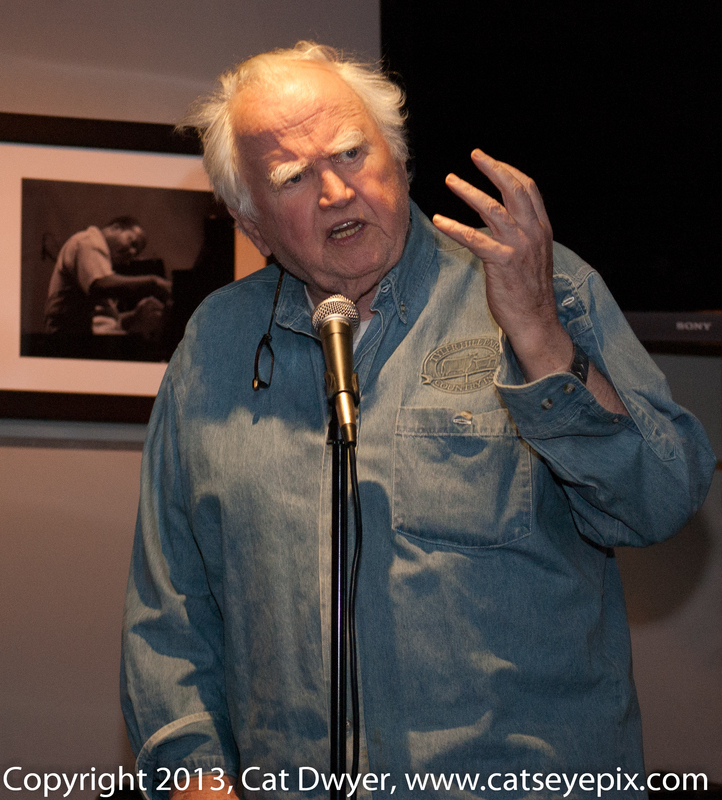 Malachy McCourt: Events in the Vatican prompted Malachy to share his views on organized religion and the selection of the new Pope, leading him naturally to tell us the story of St. Patrick and of Irish history. When we stopped laughing, Malachy closed the night with a song. The next Salon is at The Cell, 338 West 23rd Street on March 19 at 7 pm. If you would like to volunteer to host, blog about, or post videos of a Salon, email John Kearns at IASalon@hotmail.com.